Hi All~The results of our Writing Prompts Contests #51 & #52 are out! or a woman transmigrating into a man, having a rather unique transmigration viewpoint. There’s almost as many Kingdom Building genre stories as System based stories on webnovel. Although some authors will complain that there’s too many Kingdom Building stories, we still think that this genre lacks a sufficient number of top-notch novels. That’s why the excellent stories for this writing prompt will have additional chances to be featured on the front page. And, these chances won’t be limited to only the #1 ranked winner. Typically speaking, this type of story will typically have the main character transmigrating to a certain time period in history (most commonly medieval times) together with all of his or her memories. The main character will lead a new life in this different time period. This type of novel has plenty of potential. Just try imagining it. What will a modern day chemist do if he returns to medieval times and inherits a small domain? And what can he do if his domain is facing the threat of war? He knows countless chemistry formulas, he might know how to create gunpowder and explosives, or how to forge sharp weapons (this is modern day knowledge that’s easy enough for any of us to find out using Google). This can help him to obtain his father and domain citizens’ trust and win the battle in the war. In fact, your main character could even be a modern day cook, who uses his cooking skills as well as knowledge of hygiene to his advantage in a medieval age. Here’s an example from real European history. Some people believed that bathing was harmful to the body. That’s why many people wouldn’t take baths for months at a time. But actually, we know that not bathing will actually greatly increase the risk of them catching an illness. If plagues and other infectious diseases are common in this generation, how about the main character forces through a hygiene law to help decrease the risk of his citizens becoming ill? In fact, we also know the power of antibiotics such as penicillin. What if something such as penicillin appears in the medieval times and helps the citizens and warriors to stop dying to infectious diseases? It’ll seem like a heaven-sent miracle that will save countless lives. The main character will be endlessly praised for creating such a miracle. You could also write about the fantasy genre, such as dragons, magic, and other mysterious powers. Of course, the main character will need to create their own domain. He or she can use intelligence and planning to defeat their enemies, or simply win using magic or military might. Kingdom's Bloodline and Release that Witch are excellent examples of this genre that we can reference. You’re also more than welcome to write a Japanese style dungeon building novel where the main character could be a demon king or a demon king’s successor. Or, the main character could even be the dungeon itself. This is also an interesting genre to explore. When you create your new novel, you can choose any genre that you wish. Then, the writing contest options will appear. 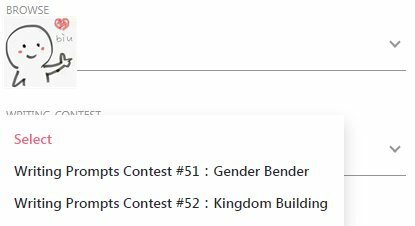 Choose the [Writing Prompts Contest #51：Gender bender] or [Writing Prompts Contest #52：Kingdom Building] option in order to participate in this contest. 1.The main topic of your novel should be Gender bender or Kingdom Building. Otherwise, it shall be treated as an invalid entry. 3.The contest will take place from January 28, 2018 to February 3, 2018 (GMT +8). WEBNOVEL_OFFICIAL what aboit male to female gender bender? democratic, republic, ruled by a monarchy, kings with their own kingdom. but a few of them reunite together and to avoid the potential crisis they decided to have one king to rule over the world. Is that a valid entry? Heya so I was actually just about to write a kindom building novel. However since its planned to go on for hundreds if not thousands of chaps Ill probably only just be able to hit the kingdom building part. Would this still be able to join the competition with only a few chapters actually on kingdom building. WEBNOVEL_OFFICIAL Where are #49 and #50 winners..? Shouldn’t they be posted already? You can go to your novel in the mobile app and tap on the Info tab. Scroll all the way down and you'll see the label Contest. You'll figure out that this is not editable. You can only edit this part the moment you create your novel, hence the rule. Let me be the first to join. Our MC reborn in rather famous world, and he decide to change the course of history by building his own kingdom, step by step, in secret, to defeat the worst villain ever in history. Would you recommend reading god of pleasure? Let me try my luck in this. Mansh67 As long as your novel's theme revolves around Kingdom Building, it is accepted. Grandeur Okay! but it's a romantic story yet to turn in that direction: I mean kingdoms and everything else. It's in the characters building phase. Can I write just one or two chapters? I'll be shameless and advertise my novel. I'm not joining the contest but my novel has 80 chaps already so check it out. Also there is a map to help readers visualize the setting. Hello, first timer here. I was wondering if there is a minimum amount of written content required for your story to be eligible for this contest? Apologize if this was asked before, couldnt find a relevant answer in my quick search. I'm joining the contest, #52 Kingdom Building. I'll join #52 Kingdom Building. I just reached 3 Chapters, Martial Arts Genre with Kingdom Building topic. A Billionaire who's addicted to Wuxia and Transmigration Novels funded a project to build a portal or a machine to travel to another universe. He made a guide and compiled all the cultivation methods, elixir & medicine recipes, martial techniques, and many things related to Wuxia and transmigration Novel. He wants to become an overpowered MC on his own way in another universe. He also prepared Hi-Tech weapons such as laser sword, Hydraulic Claws, Pulverizing Hammer, Magnetic Axe, and many more. Everything went well, he's very prepared but it did not go as planned. All non-living objects were transported safe and sound except for this man. His body couldn't handle it so he died miserably. His treasures where sent to a Parallel Universe where the strong preys on weak and technology is non existent. People were focused solely on strengthening themselves. Imagine the chaos when all the kingdom, clans, and empires around the world fight for the powerful weapons dropped from the sky. Is it a curse that brings chaos or a heaven sent blessing to bring justice? Belg4r the competition would probably be over by the time u get to kingdom building lol. YESS FINALLY A GENDER BENDER! !